It's been a good year for Galer Estate Vineyard & Winery. In February, they announced a "Best in Class" achievement in the esteemed International Eastern Wine Competition. In light of the award, we caught up with owners Brad and Lele Galer to see how things have been otherwise. West Chester & Chadds Ford Life: Could you talk in more detail about the awards you've won this year so far? What were they, how did you find out, what were your reactions to each, how important are they for business? Lele & Brad Galer: This year (2015) the only competition we’ve entered so far is The International Eastern Wine Competition (IEWC), which was established in 1975 and is one of the oldest and largest professional wine competitions in the United States. The judging was held Feb. 10-11, 2015 in Sonoma County, California. Over 100 wineries from 32 different states and other countries submitted 1,162 bottles of their best wines. The international judges selected Galer Estate’s 2013 Chardonnay from Equivine Vineyard as their “Best in Class” and also chose Galer Estate’s 2013 Albariño as a Bronze Medal winner. We have actually entered this well-established competition before and won other awards: in 2012 our 2010 Chardonnay won a bronze medal and in 2013 our 2010 Red Reserve won a silver medal. We have realized, unfortunately, that most local Pennsylvania wine drinkers are not even aware that quality wine is being produced right in their backyards. In order to change their attitudes about our wines, we’ve decided our best marketing tool is to enter prestigious, well respected national and international wine competitions to demonstrate to everybody, whether it be here in the Brandywine Valley or in Napa California, that Galer Estate wines can indeed stand up to any quality wine worldwide. We indeed are extremely proud of not just this new award, but also the over 80 other awards that our wines have won in the past several years since we opened our doors in winter of 2011. We have received many gold medals as well, including double-golds and two best in shows for our dessert wines (Vidal Blanc and Cabernet Franc "ice wines"). I don't know really how much they impact our business in the long run, but it is a great boost to the Galer team as we strive to make the best quality wines that we can. That is what we set out to do from the start. 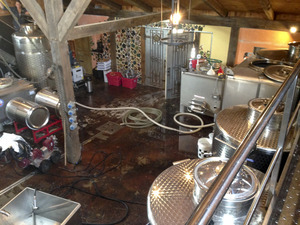 WCCFL: Can you also go in more detail about your new winemaker? Why the change? What makes him/her great? How has this impacted business for you? The Galer's: Our new winemaker, Virginia Smith Mitchell, started with us last Spring. Prior, she was the Assistant Winemaker at Mazza Vineyards in North East, Pennsylvania, which is the largest winery in the state, producing over 35,000 cases of wine every year. She graduated from Penn State’s Food Science Program while completing an extensive internship at Mazza. Virginia also did a harvest in Australia at Two Hands Wines in the Barossa Valley before becoming Mazza Vineyards’ Assistant Winemaker. Virginia has vast knowledge and experience in the special uniqueness of making high quality wine from Pennsylvania grapes- the grape varietals that make the best premium white and red wines, optimal processes to produce wine blends, dry rose wines and sparkling wines, and intimate knowledge on how to care for wines while being fermented and aged. Virginia has brought a new zest for winemaking to Galer and has added several new types of wines that will be released this year, such as a sparkling Vidal Blanc wine and a new dry Rosé from pressed Chester County Pinot Noir grapes. In addition, she has experimented with Mead wine made for Chester County honey, which is unbelievably delicious and will also be released soon. She has been an incredibly strong addition to the Galer team, and she came to us with the highest recommendations. We feel very fortunate indeed. Our previous winemaker left to join a much larger winery in Maryland, while Virginia left a huge winery in order to make boutique wines with us. WCCFL: Looking back to when you first opened, if you were to go back and tell yourself where your business is today, how would your past self react? The Galer's: “Are you kidding me? !” We think our jaws would drop in how successful our business has become- with regards to the local notoriety and “fans” of GE, but also with regards to the international and national accolades the wine has received. But most important we would be (and are!) most proud of the people that make up GE- Jan Grimes and the workers in the vineyard, Virginia Mitchell in the winery, Josh Towber who runs the wine tasting room, Cate Kelly who is our event coordinator, and all the folks that have worked in our wine tasting room. It is everyone’s passion and dedication that has made our success. Every single person who is part of the Galer Estate family plays a critical role in our success. When we chose our tagline “Blending Nature, Science and Art” close to 10 years ago, little did we know how so very true this phrase reflects this business. And you are only successful if you pay attention to and pay homage to each segment- in the vineyard, winery, and wine tasting room experience. WCCFL: You said you made some staff changes, and that it is good news. Can you go into more detail? The Galer's: In the past year we hired Virginia, brought Jan Grimes back as Vineyard Manager, moved Josh Towber up as Sales Manager and solidified Cate Kelly's role as Event Manager, oh! and we just hired a bookkeeper (great news for Lele). Lele manages the operations and the artistic elements of the winery, while Brad continues to play a role in the tasting trials and grape and vine choices. The more that our business is solidified, the better run, and more organized the staffing responsibilities. In the beginning, everyone did a little of everything. We tried new things, and they didn't always work out..we tried to be all things to all customers, and that just doesn't work. Even now, we are pairing down our selection of wines, and meeting to discuss what we should and should not do. A solid team like ours is able to brainstorm and discuss plans from multiple viewpoints. Before we had too many vineyard and sales people and stretched our team too thin in areas that we didn't need to go (like big wine festivals and things like that). WCCFL: What events/new things do you have on the horizon for the rest of the year? The Galer's: As mentioned earlier, we are extremely excited about the releases of several new types of wine- a new dry Pinot Noir Rose, a new sparkling Vidal Blanc, and a new Mead wine. We plan on continuing to offer pop up art shows every Thursday, live music on the weekends, yoga on Sundays, and encourage and promote our community non-profits, and local business partners. Lele is active with many non-profits and enjoys being able to support their good works. Lele is working to create an Artisan Wine trail to connect all of the wine and vineyards in this area..but not sure if they are all on board --stay tuned! WCCFL: Anything else you'd like to add? The Galer's: One thing we’ve learned since starting this business is that every year brings new excitement, challenges and opportunities- especially in the vineyard and wine cellar. Our climate and its effect on the grapes changes year to year and is completely unpredictable, which makes it fun and interesting. Nature keeps you on your toes every year- but like people, the vines are usually quite hardy and resistant- wanting to produce the best quality grapes, if they are cared for properly year round. We are also very grateful that Galer Estate has become an integral part of both the community and also of so many of our customers’ lives. The winery is a great meeting ground for small businesses, nonprofits and families, and everyone seems to love the wines, the atmosphere and what we have created here together. And by providing a venue for local artists, painters, sculptures, and musicians, to show their talent, we hope Galer Estate has added to our Chester County culture. We feel very proud of what we have accomplished and appreciate very much all the support that we have received over the years from the winery community, the neighbors, township, friends and our customers. Galer Estate is located at 1740 Lenape Road, West Chester, and 700 Folly Hill Road, Kennett Square. For more information, call 610-793-5134, or visit galerestate.com.